over the loss of my life's partner. Take him/her into your heavenly kingdom as a reward for his/her earthly service. Help me to cope with my loss by relying on You even more than before. and make me give myself to others more readily, so that I may continue to live in your grace and to do the tasks that You have laid out for me. Amen. O God the Father, of heaven: have mercy upon us. O Holy Trinity, one God: have mercy upon us. Immaculate Virgin: Mother and Mistress of our Order: Pray for us. St. Elizabeth, Princess of Hungary: Pray for us. 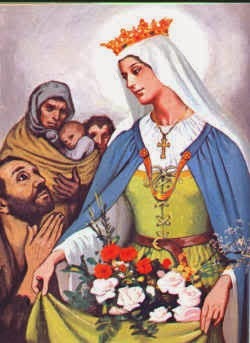 St. Elizabeth, Duchess of Thuringia: Pray for us. St. Elizabeth, mother in Israel: Pray for us. St. Elizabeth, queen in the Kingdom of God: Pray for us. St. Elizabeth, consoler of sinners: Pray for us. St. Elizabeth, nurse of lepers: Pray for us. St. Elizabeth, devoted wife of Louis the Good: Pray for us. St. Elizabeth, famous exemplar of Christian widowhood: Pray for us. St. Elizabeth, fervent spouse of the Son of God: Pray for us. St. Elizabeth, humble in prosperity: Pray for us. St. Elizabeth, patient in adversity: Pray for us. St. Elizabeth, mighty in penance: Pray for us. St. Elizabeth, wondrous in prayer: Pray for us. St. Elizabeth, first-born of the tertiaries regular: Pray for us. St. Elizabeth, protectress of our Order: Pray for us. St. Elizabeth, the "dear saint" of Holy Church: Pray for us. O Lamb of God, that takest away the sins of the world: spare us, O Lord. O Lamb of God, that takest away the sins of the world: graciously hear us, O Lord. O Lamb of God, that takest away the sins of the world: have mercy on us. V. Pray for us, O blessed Elizabeth. Alleluia. Let us pray: Merciful Lord, we pray Thee to pour the bright beams of Thy grace into our hearts: that, by the glorious prayers of Thy Saint Elizabeth, we may learn to despise all worldly prosperity, and ever to rejoice in all Heavenly consolation. Through Christ our Lord. Amen.